The University of Nottingham hosted a fascinating lecture by Rick Borchelt on science communication today. Rick is Special Assistant for Public Affairs to the Director of the National Cancer Institute at the US National Institutes of Health. He has also held many other posts including that of Special Assistant for Public Affairs in Science and Technology in the Executive Office of The President during the Clinton Administration. Rick began by describing how he had started his PhD with an interest in spiders, which went well for about two months until the supervisor died. The college then gave Rick a project on Butterflies because that was what the college had funding for. Although perhaps less fun, this muddled along for about two months until the supervisor died. If there is one thing that scientists can do well, it is to spot a trend - and the staff could clearly see that becoming Rick's supervisor was potentially a life threatening move. So they gave Rick the project of someone who was already dead. This was a project on microlepidoptera, months only a few millimetres in size who spend their caterpillar days munching away between the top and bottom surfaces of a leaf. You can find some information on them here, here and a paper with some groovy SEM imagery here. 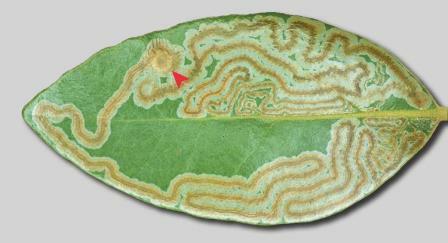 Leaf mines by Phyllocnistis hyperpersea on Persea borbonia. The red arrow indicates the pupal crypt. As part of the project, Rick found himself spending the summer at the Smithsonian Museum moving microlepidoptera from box to box in a small humid room high in the building. The location of the room meant that Rick could hear many of the conversations that were happening in the museum as they echoed up through the ventilation tubes. At 2pm there would be a huge increase in noise as all the kids piled into the insect section to watch the tarantulas being fed mice and Rick noticed that the children were asking some very deep questions. Why did spiders have eight legs? Why were only some venoms poisonous to humans? Why? Why? Why? But the conversations coming up from the head of the insect department were very different. They were about the minutae of how a particular insect should be classified. Rick noted the huge discrepancy between what the scientists and the public were saying. He also noticed that, as things stood, his career appears to one involving years of detailed inspection of moths. So Rick decided that perhaps he was not in quite the right career after all, so enrolled on a journalism and science writing course. Eventually, this took him to the giddy heights of the West Wing of the White House, and Rick was kind enough to answer the question that everyone was thinking “Is the real West Wing the same as the TV West Wing”. Unlike the TV version, the real West Wing has some rather dodgy décor, with wires hanging from the odd ceiling, and some somewhat manky carpets. Nor are the conversations in the real West Wing as erudite as those on the TV. But there is one way thing that both the real and TV West Wings share - science advisors are never seen in either one. Rick pointed out that, as far as politicians are concerned, the answer to the question “Is there a role for science in defining policy?” is “not if you want to get re-elected”. How do people react to images of scientists? The talk then moved on to discuss the work that Rick had undertaken to evaluate whether PCST (Public Communication in Science and Technology) was really a valid field of study in its own right. Happily for both you the reader and NSB, some slides of a very similar talk by Rick can be found here, and are certainly worth having a look at. 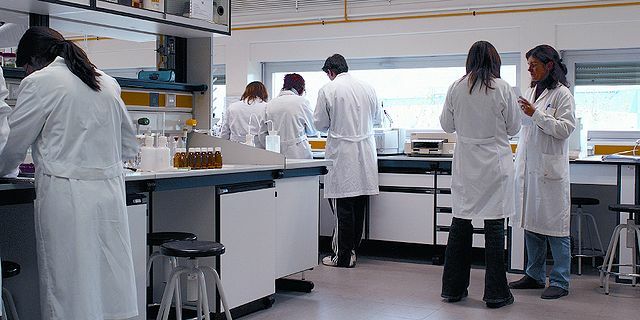 Combing the peer-reviewed literature, and using a series of search terms such as “Science / Technology Communication” and “Science Journalism”, the research unearthed some 1,237 papers in 471 Journals, in the 2000-2009 time period. The number of papers published was increasing during this time, from some 62 papers in 2000 to 196 in 2009. The most popular journals for publication were “Public Understanding of Science” (179 papers) and “Science Communication” (135 papers). And it was heartening to see that the University of Nottinghams own Brigitte Nerlich was in the top 10 authors (with 14 papers). The very large majority of research methods used were Surveys, Content Analysis, Interviews or Case Studies, thus showing a very marked preference for quantitative data. One aspect of the research that surprised NSB was that it seemed to be the case ( so far as NSB could tell) that much of it was driven by companies trying to find out what words or techniques would allow them to “sell” a particular technology (e.g. GMO, Nanotechnology) - in case after case, the quantitative methods used would fail to deliver what the sponsoring companies wanted and their funding would dry up - only to be replaced by the next technology wanting to find out what key words would work for the general public. For example, it was commented that GMO funding moved away when the funders realised that, even after all this work, the public “still hated them”. Rick felt strongly that the PTSC practitioners were simply repeating the same research again and again - without actually evolving the knowledge base at all. This was perhaps not surprising as there was little sustained funding to address the fundamental questions in PCST. 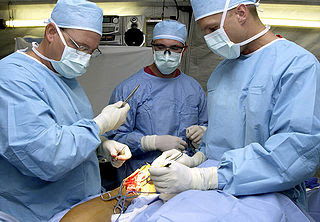 How do people react to images of surgeons? Perhaps the most interesting part of the talk last the last section, when Rick argued that science had lost its place in society. He described how he had just taken a tour of some of the archaeological artifacts at the University and seeing the ancient spearheads had made him realise that, all those thousands of years ago, science was intimately involved in society - because if a tribe did not develop the next generation of spearhead they were going to be wiped out. An anecdote gave a good example of how unclear even scientists were of the place of science in society - some researchers recently developed a strain of GM mosquito that would kill that malaria bug. When asked whether the public should be informed about their research, the scientists overwhelmingly said “Yes”. But when asked whether the public should be informed now, before the mosquitoes were released in the wild, and the answer was overwhelmingly “No”, because the scientists were afraid the public would block the project. Why don’t turtles, one of the oldest species on earth, ever get cancer? Nobody knows. Why are obese people more likely to get cancer? Nobody knows. and mentioned that work was ongoing to build deep community engagement projects using "provocative questions" such as these. He suggested that PTSC practitioners should work “in the valleys” between the popular questions to investigate topics that will genuinely develop the field. After the talk, NSB asked Rick what he felt were some of the barriers to people who were interested in science and wanted to find out more about a topic or story they had seen in the media. Rick responded by saying that it was certainly a problem that media organisations often did not give links for people to the original research (which was something he tried to do when publishing material) but that one could often find out more by contacting the university that had performed the research. NSB has to point out that the fact that a set of slides of the talk (or at least one very similar) has made the blog post that you are reading more accurate and also saved several hours in its preparation. How do people react to schematics of chemicals (Vitamin C in this case)? Rating on the NSB Science Accessability Criteria. NB: Thanks to Sons No1 and 2 for providing input to some of the questions on the criteria. That was rather superstitious of them (about the supervisors' deaths). Now, I'm just really curious whether he did get to finish or not.